If you are a Homeowner interested in attending the event, please CLICK HERE to find the information you need. Businesses, thank you for visiting the Lake County Home Show Exhibitor Page, designed for those who are interested in participating in our events. Due to record demand, we have added a 2nd Lake County show to our 2019 schedule to reach homeowners later in the year. The event is scheduled for October 19th & 20th and booths are available to you at this time. Details on all Ten Home Shows we are producing in Chicago area in 2019 can be dowloaded by Clicking Here or on the button further down this page. 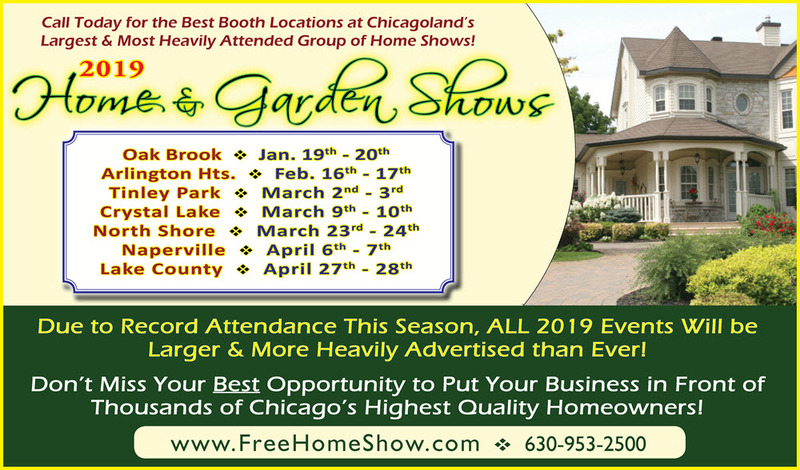 Our 2019 Lake County Home and Garden Shows provides your business the best opportunity to meet, speak with and sell to thousands of qualified, motivated homeowners from highly sought after markets in the Chicago area. These buyers use this massive event as their tool to purchase products and services from businesses like yours, for their upcoming home remodeling, repair, furnishing, decor, outdoor and other improvement projects. In 2018, we had a lines out the doors, attracting well over 10,000 homeowners with exhibitors calling it the “Best Lake County Home Show Ever!” Now, the 2019 Spring and Fall events will be even larger and we have substantially increased the advertising over last year with the specific goal of setting new records in both attendance AND productivity for our exhibitors, so there clearly has never been a better time to get involved. To see photos from our recent events throughout Chicagoland, CLICK HERE. The growth and high return rate of our exhibitors for 2019 proves that this event not only produced substantial amounts of leads and appointments … but more importantly, true buyers! This increase in support from these businesses like yours allows us to invest more heavily into the advertising plan supporting this yea’rs event and that is why expectations are so high. In fact, we produce the most heavily advertised events of their kind in the entire Chicago area. No exceptions. ….. But you don’t have to take our word for it. When searching for the best home improvement shows with the greatest level of exhibitor support and the strongest track record of consistency, growth and productivity . . . solid, reliable information is priceless. We are proud of our reputation and our commitment to providing you the absolute best events, so to assist you in making the most informed decision possible for your business, CLICK HERE for a list of references from the most active exhibitors in the Chicago area. Feel free to reach out to hear from them first-hand how they feel about our events. Please read on for further information, but if you would like to move forward now and/or if you have ANY questions, please call us at 630-953-2500 or CLICK HERE to E-Mail Us Today and we will be happy to assist. Overall Household Income levels for our attendees are among the best in the Midwest! Overall Average Home Value levels are also towards the top in the Midwest! Please click below to request a show information packet to allow you to secure the most productive booths for your company. Don’t miss this amazing opportunity to put your business in front of thousands of qualified, motivated homeowners in Chicago area’s most sought after markets! As always, please call us at 630-953-2500 or email us at Info@FreeHomeShow.com if you have any questions and we will be glad to help. We look forward to the opportunity to work with you at our home shows in 2019 and beyond.